You go to a famous supermarket chain to purchase groceries. You find that they are running a contest giveaway and offering a free prize to lucky winners. Would you take part in the contest just to win something for free? We all love freebies and are willing to do everything in our power to get our hands on them. The same applies to social media as well. This is why businesses are forever eager to organise social media contests. These can offer a treasure trove of free goodies to their followers. And boost engagement and their level of happiness with the brand. 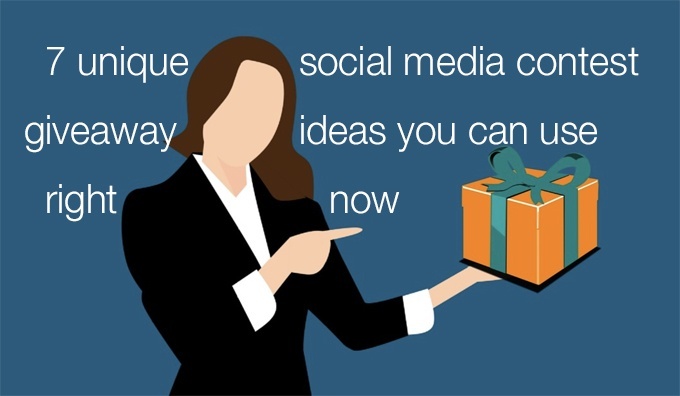 If you are planning to run a social media contest giveaway and shower your visitors with some love and lots of free stuff, here are some of the ideas that you can tinker around with. Human are visual creatures and our brains process visual information much faster than words. 90% of information transmitted to our brain is visual. We tend to remember more of what we see than what we read. Ask any social media aficionado and they will gush about how they absolutely dig photo contests. The reason is photo contests keep participants engaged and hooked for longer. This is a great way for brands to collect user-generated content. And can be used to attract new customers and foster trust. The Man of Steel Facebook contest was the best example in this regard. If a picture is worth a thousand words, a video is worth a million. Nothing can go more viral on social media than videos. Just like photo contests, a video contest provides access to user generated content which can be used as testimonials. Organising a video contest offers your followers a platform to voice their opinions and flaunt their talents. Which they will certainly appreciate. In the Kampung Sembawang video contest, Singapore residents were asked to show love for Singapore by recording a video. The best entry received a free contest giveaway. The video contest for the movie “The Hobbit” was a great hit. Movie fans were able to ask questions from the movie director Peter Jackson via a recorded video. VerveGirl makeup tutorial turned fashionista video bloggers into YouTube sensations, which escaped nobody’s notice. Do you want your social media contest giveaways to go viral? If yes, incentivise your social media followers by rewarding them when they share your contest giveaway with others. The prowess of referrals will see your social media engagement soar up to the skies. This enticement will also attract new fans and persuade them to engage with your brand on social media. The hype surrounding your social media contest giveaway would have spread like wildfire. Hashtags: we all use them! But did you know that you can also organise a hashtag contest on social media to boost its virility? Creating a hashtag for your social media contest giveaway can synch all your entries under a single umbrella. Additionally, it allows you to track engagements and other metrics effortlessly. Make your social media contest stand out by choosing a unique hashtag for your contest. Businesses can also capitalise on state-of-the-art tools to pull photos from a popular app. This directly uploads them to an entry gallery. Are your social media followers sluggish or languid? Even to the extent that they do not bother to react to anything you post, despite how humorous, or informative, or engaging it is? If this scenario rings a bell, fret not. Concentrate on creating a sense of urgency by incorporating a countdown timer to your giveaway contest. This would tell your social followers this is a limited time offer, stirring them into action. It would also coax them into taking action quickly, especially if what you are offering is drool-worthy enough. Make sure that the countdown timer is placed at the centre of the contest page to make it easily discernible and accessible to all visitors. Regardless of whether you run ads pertaining to your social media contest giveaway or ask your followers to change their cover photo for the contest or update their bio, promoting your social media contest is crucial to its success. How can people stay in the loop when they are oblivious to what is going on? They cannot. You will have to spread the word and promote your contest through myriad strategies and tactics so that more people are aware of your contest. For instance, you can cross promote your Facebook contest giveaway across all other social media platforms such as Twitter, Instagram and Pinterest. Another way to create the right buzz about your social media contest giveaway is to share some of the best entries with your social media audience. This makes your social followers feel important. It makes them believe you care more about simply conjuring up ways of milking their wallets dry. Remember to tag them, recognise them and appreciate their work. On the flip side, it gives other contest participants a clear picture about what works and what does not. When they have a clear idea about what will gain acceptance, your social media giveaway contests are bound to be much more interesting and hookable. Starbucks’s Instagram account is loaded with user generated content and they regularly share their best entries and endorse their fans and followers. Keeping your social media followers engaged is not easy, especially with the ever dwindling attention spans of audiences. Constantly wavering algorithm updates on popular social platforms make life even more difficult for business when it comes to boosting engagement. Brands are forced to evaluate different options, such as organising social media giveaway contests, to keep the curiosity and interest of their social media followers piqued. How do you boost social media engagement through social media contests? Feel free to share it with us in the comments section below.